If you’re reading this, you probably know that April is National Poetry Month. But did you know it’s Jazz Appreciation Month, too? Even if it’s a total coincidence (there are only twelve months, after all), as a jazz musician and something of a poet I’ve always naturally linked the two media. And you don’t just find the connection in beat poetry. Sidney Bechet, one of the greatest New Orleans jazz musicians of all time, once described jazz music as “a lost thing finding itself.” Isn’t that exactly what poetry is, too? The Romantics’ longing for childhood innocence—that’s what jazz is all about (jazz musicians do, after all, play music, and with the same carefree vim they felt in the sandbox so many years before). The Victorian struggle against social conformity—that’s jazz, rubbing against boundaries with every squeal. 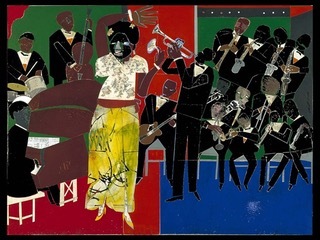 And the modernists’ devotion to the abstract is, through and through, jazz-distinctive. April’s an opportunity, then, for us to find our lost selves with the help of our eyes and our ears. Here are some awesome jazz-related poems with auditory pairings to get you started. Whether you’re into Ginsberg or not, “Song” screams jazz. This poem’s a good follow-up to “Song,” since di Prima was one of Ginsberg’s contemporaries. And its “white silence filling the contours of my life” totally fits with Miles’s Cool Aesthetic: he was the king of tasteful space in solos, and I think you see it most in this tune. Here’s a match for those cruel April days we know so well. Even though Bessie sure does croon a “sad raggy tune,” there’s no denying that she makes it a “Sweet Blues,” too, through her voice’s characteristic rawness. Instead of just pairing the poem with the tune it’s actually about, I thought it might be cool to try putting the poem in a more sobbingly woeful tune’s light. Don’t get me wrong, I’d never discourage listening to “Alabama,” but I think you can hear “Naima” parallel a lot of the poem’s horror in repose. I think both the poem and the tune reflect the chaotic ends of Bechet’s lost-things-finding-themselves idea. I wouldn’t blame you if you weren’t into Ornette’s… freedom. But I hope we can at least agree that the frenzied points in Myles’s poem are charming. As fun as it was to pair these poems and tunes together, I’m just another lost thing finding himself through April’s honored arts. There are way more connections to discover between jazz and poetry than the five above. So here’s to a month’s worth of lost things found. Ryan’s a first-year in the College who hopes to major in English. As far as you know, he has no interests besides jazz and poetry. That’s all right with him.